Music educator and bassist Liam Onaitis facilitates this all-comers jazz jam and offers guidance and mentoring to those who are looking to improve their skills. This opportunity for music students and more seasoned players to play together grew out of a desire by local music supporters to give young musicians a means to expand their knowledge and experience in live music performance. 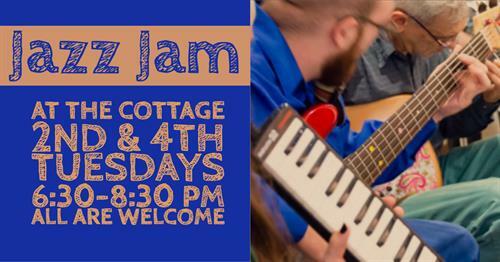 Jazz Jam at The Cottage is sponsored by Music Money 501c3, a local organization that focuses on building community with music. The Jam meets on the 2nd and 4th Tuesdays of the month. Participants sign up at the door, and can be added to the email list for a preview of the next session's five “songs of the week”. Even though this is a learning environment rather than a polished performance, the listening public is encouraged to attend. A sliding scale donation helps to support the effort, no one is turned away for lack of funds. Beverages and snacks are offered for sale.